Advertisement is the soul of Marketing and a major part of almost all types of businesses. In most of the companies there is a separate department dedicated to Advertising and Marketing. Now you must be wondering why is Advertisement so important for any business? Let’s understand this with an example. Imagine you are selling yoga mats. Just setting up a brick and mortar store or a website, wouldn’t get you leads. In order to increase the awareness of your yoga mats business among the target audience, you need to advertise your business among them. Be it traditional advertising like pamphlets, posters etc., or digital marketing like newsletters, PPC campaigns etc., advertising is the most effective way to make people know about your yoga mats. Identify your target audience while designing and planning out an Advertisement. Your Advertisement should be prepared according to perception of your target audience and in order to know about this you need to identify them first. Identify the interests and likings of your target audience and keep them in your mind while executing the design process of Advertisement. In order to make any Advertisement effective it is important to understand the perception of the intended consumers. This helps in creating an Advertisement which can stimulate the target audience or intended consumer to avail the advertised product or service. Visibility is an important aspect that needs to be considered while advertising goods or services. Your Advertisement must be visible to your target audience or the intended consumers. Increasing the visibility of your Advertisement will help in instigating the consumers to avail your service or product. Advertisement must be designed and developed in order to attract the consumer towards it. The first visual, line or headline of the Advertisement must be capable of prompting the consumer to read it or have a look. Never make the Advertisement lengthy, monotonous and excessively informative. It should be short and crisp so that the audience is able to grasp the gist and is not bored by the lengthiness and monotony of the Advertisement. Apart from the above tips it is important to post your Advertisement at the appropriate platform. Online B2B Portals and B2C Portals could prove to be a suitable platform for advertising goods or services. These Online Advertising Portals can make your Advertisement more visible to intended consumers or target audience. 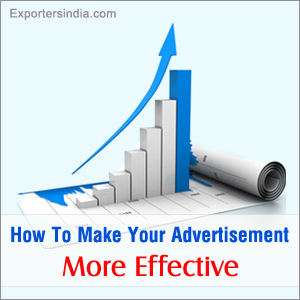 By following these tips you are sure to end up making an effective and appealing Advertisement. 2 thoughts on "How To Make Your Advertisement More Effective"
Appreciation to my father who suggest me this website, this website is truly remarkable.